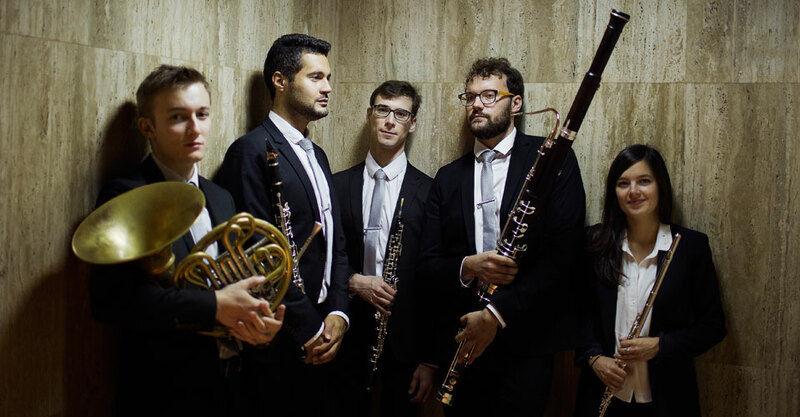 The Ensemble Ouranos was founded in 2014 by five young soloists, studying at the Paris Conservatory, eager to explore the great wind quintet repertoire. Each of its members has been individually rewarded in major international competitions, and they have collaborated with some of the best players of their generation, producing colorful and resolutely personal interpretations of the chamber music repertoire. In April 2017, the ensemble won the First Prize, the Audience Prize, the Internet Prize, and the Bullukian Prize at the 13th Lyon International Competition for Chamber Music. Resident Artists at the Fondation Singer-Polignac in Paris since 2014, the Ensemble Ouranos has also performed in prestigious venues such as the Théatre des Champs Elysées in Paris, the Opera of Lyon, and the Théâtre du Casino in Deauville. The ensemble has shared the stage with renowned artists including Renaud Capuçon, Nicholas Angelich, Bertrand Chamayou, François Salque, Bruno Philippe, and The Hermes Quartet. They will soon release their first recording, produced by NoMad Music and featuring works by Dvorak, Ligeti and Nielsen.